All Christians trust the Bible, including (especially) the New Testament. But the Bible leads me to the Church. This happens in two ways. First, the Bible tells me that Christ established a Church and gave her His authority to teach in His name. So, the Bible sends me forward to the Church, from Christ to His Church as His invention. The Bible also sends me backward to the Church, for the Church is its cause. It is a historical fact that it was the Church (the apostles) that wrote the New Testament. It was also the Church that defined its contents, its canon — that told us which books did and which books did not belong in the sacred canon, the books that were divinely inspired and religiously infallible and authoritative. How else does any Christian know that the Gospel of Thomas and the Gospel of Judas are not part of the Bible, part of infallible divine revelation, and that James and Jude and Revelation are? There is one and only one clear answer to that question: by the authority of the Church. In other words, the Church was both the efficient cause (the author) and the formal cause (the definer) of the New Testament. That is historical data. Let that be premise 1. But no effect can be greater than its cause (that is logically self-evident and indubitable), and the infallible is greater than the fallible; therefore, the infallible cannot be caused by the fallible. That is also logically evident. Let that be premise 2. This article is from a chapter in Forty Reasons I Am a Catholic. Either the Church is fallible or infallible. That is also logically self-evident. Let that be premise 3. Therefore, if the New Testament is infallible, the Church must be infallible, and if the Church is not infallible, then the New Testament is not either. Logically, those are the only two possibilities, unless we deny either the historical data (premise 1) or one of the self-evident assumptions (2 or 3). Go through it again. If the Church is fallible, as Protestants say, she cannot produce an infallible effect in the Bible. And therefore, if the Church is fallible, then the New Testament is also fallible, like its cause. On the other hand, if the New Testament is infallible, as both Protestants and Catholics say, then the Church, which was its cause, must also be infallible. Only if she is infallible can she produce an infallible effect. Thus, we see in history what we would logically expect: that most of the “mainline” Protestant denominations have eventually abandoned the claim of infallibility for the New Testament and embraced modernist or liberal theology, for that is the logical conclusion of the denial of the infallibility of the Church. But never has the Catholic Church done so. So, if I want to be an orthodox Christian and believe that the Bible is infallible, I have to be a Catholic and believe that the Church also has that divine gift. Church and Scripture go together, like body and soul. I have probably offended modernist or liberal Christians in what I have said above about the Bible. I will now probably offend Fundamentalist Christians in what I will say below about the Bible. That’s fine with me. Jesus also offended opposite extremes, opposite parties — the Pharisees and the Sadducees. The Bible is infallible in its religious teachings (and that includes morality, which is an essential part of religion for Jews and Christians), but not in its grammar or science or math. God did not give us the Bible to teach us grammar or science or math. The infallibility of the Bible does not extend to these things. It’s simply a fact that there are some grammatical, scientific, and mathematical contradictions and errors in the Bible. Now here’s the point, the parallel between the Bible and the Church. The Church too is fallible in everything except her authoritative religious dogmas. The Church has taught some things, such as geocentrism, and done some pretty bad things, such as the Inquisition, but not infallibly, not authoritatively, not as Magisterium, or religious teacher. Popes have made mistakes, but not ex cathedra. So once again the Bible and the Church are together. They are in the same boat. Each one sends you to the other one. If you want either one, you need the other. It’s not sola scriptura. Even after I figured out the logic of this argument, it was still hard for me to overcome either of my Protestant beliefs (1) that the Church was fallible and (2) that the Bible was not. But I knew, by reason, that I had to abandon one. So which was more certain to me: that the Church was fallible or that the Bible was not? Was my faith more fundamentally anti–Catholic Church or pro-Bible? Once the question appeared that way, the answer was clear. When my faith and my reason thus married, they produced a Catholic baby. 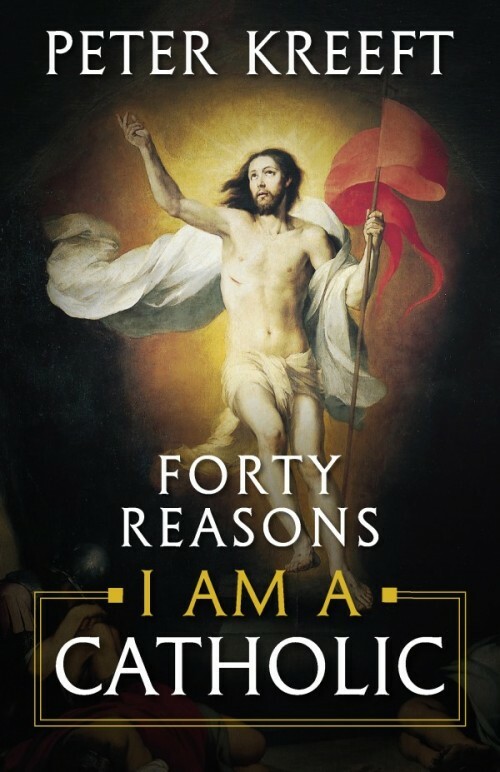 This article is adapted from a chapter in Dr. Kreeft’s Forty Reasons I Am a Catholic, which is available from Sophia Institute Press as a paperback or ebook. Peter Kreeft, Ph.D., is a professor of philosophy at Boston College and also at the King's College (Empire State Building) in New York City. He is a regular contributor to several Christian publications, is in wide demand as a speaker at conferences, and is the author of over 55 books. Dr. Kreeft is a convert to the Catholic Church from reformed Protestantism. He earned an A.B. degree from Calvin College, an M.A. and Ph.D. from Fordham University, followed by post-doctoral work at Yale University. He has received several honors for achievements in the field of philosophy, including the Woodrow Wilson Award, Yale-Sterling Fellowship, Newman Alumni Scholarship, Danforth Asian Religions Fellowship, and a Weathersfield Homeland Foundation Fellowship.